Perhaps you’ve heard of WorldCat, which is, in brief, “the world’s largest network of library content and services” — but to folks like you and me, that means that we can search across many different library collections for a particular holding. It’s fun, it’s convenient, and it helped Yours Truly solve an Advanced Power Searching with Google challenge. It is pretty cool. 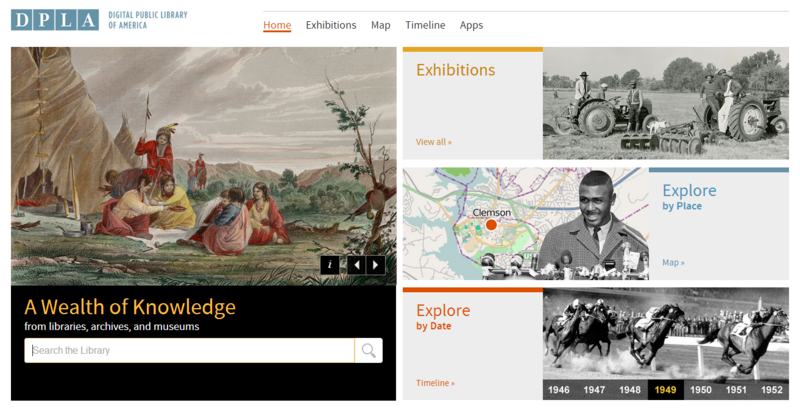 Enter the Digital Public Library of America (DPLA), which officially launched yesterday, April 18th. In the same vein as WorldCat, DPLA fills a different ecological niche. And, ladies and gentlemen, this promises to be the One Library to Rule Them All. It’s for students, teachers, researchers, writers, makers, thinkers, and the merely curious. It’s for you, whether or not you feel it yet. This works, this will increasingly work, because it follows one of our favorite mantras: Everybody Wins. The libraries, archives, and museums get to showcase their holdings to a broader audience while ensuring that visitors ultimately arrive at their sites; DPLAgets to take a leading role in defining our encounters with information on the Web; the public, meanwhile (and not just in the United States), gets rich, structured, easy access to the library’s “holdings”: one-stop shopping for the Information Age. Moreover, DPLA is helping to advance the cause of Open: user-uploaded content is licensed under Creative Commons Attribution (CC BY), while the library metadata is given over to the public domain (CC0). Go explore, and let them know what you think — this thing was built just about from scratch by folks with the smarts and backing to make the digital future exactly how we want it. Image above is author’s screenshot of a portion of the DPLA homepage on April 19, 2013.